Wayne Stack from Christchurch is going be painting a batch of figures for this project. 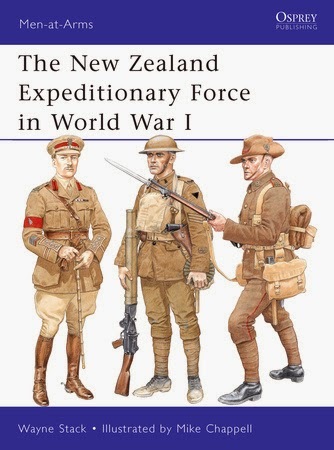 But he is also the author of the Osprey Men-at-Arms book, The New Zealand Expeditionary Force in World War 1, which some of you may like to use as an additional painting reference for your Kiwi figures. The colour plates produced in the book by renowned military artist, Mike Chappell, are simply superb, and were believed to be the first known colour plates published of New Zealand military forces for that period. The uniform details were meticulously researched with the assistance of Barry O'Sullivan, arguably the foremost authority on NZ military uniforms and equipment from 1910 to 1945. For those interested, copies of this book can be purchased in New Zealand through Fishpond for $21.15 and can be found in the military section at large Whitcoulls stores. They can also be purchased direct through Osprey at www.ospreypublishing.com - priced at 5.49 pounds for a paperback copy or 7.99 pounds as an eBook. By the way, Wayne says he's not trying to get more sales to gain any royalties as he was paid a commission to write it! "priced at 5.49 pounds for a paperback copy or 7.99 pounds as an eBook." The paperback is normally 9.99 pounds, but is currently on sale for 5.49 pounds. But the e-book isn't on sale, so the paperback is now cheaper. Thanks Roly but I'll hold off just in case I get Turks to paint!